I recently was able to try out the SousVide Supreme Demi. 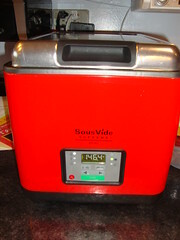 We were loaned it for about two weeks or so, and we tried several different meals in it. Up until recently, I hadn’t heard of SousVide cooking before. It’s actually pretty cool. Instead of a hot flame (like you are use to cooking with), you are cooking with hot water! It is basically a water oven. It was super easy to use also — just vacuum seal food in the food grade cooking pouches and simmer in the water bath. Each kind of food you put in there has a temperature and a time frame it needs to cook. What kinds of food can you cook in there? Any kind — beef, lamb, game, pork, chicken, fish, seafood, and even vegetables! To be honest, this is foolproof to use. We made vegetables, chicken, and beef with it. What did we think? It was great! The steaks we made were super yummy and tender. You could literally cut the steaks with a fork. The veggies were super soft too. The chicken in here just soaked up the seasonings we added in and was pretty awesome. I have to admit that the SousVide is an amazing way to cook. I love that I could put dinner in the SousVide Sepreme Demi in the afternoon and have dinner ready with little to no work. Have you tried SousVide cooking before? What did you think?